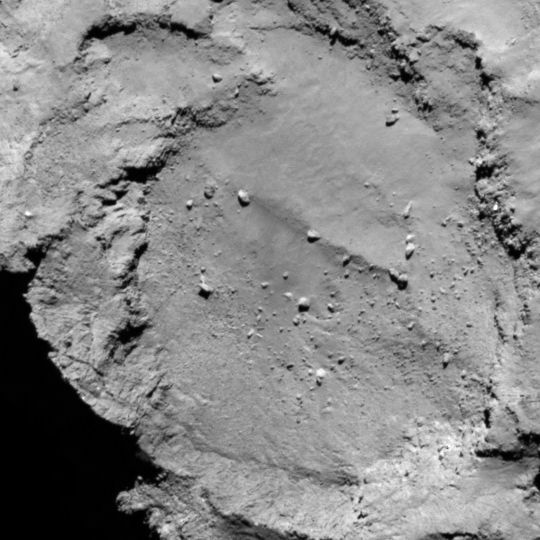 Two and a half months before the long-awaited touchdown of Philae, scores of scientists from ESA, CNES, DLR and other agencies and laboratories convened at CNES in Toulouse this weekend, to draw up a list of five suitable landing sites on the nucleus of comet Churyumov-Gerasimenko (67P). Touchdown is still on-schedule for mid-November. Location of the five landing sites selected for Philae. Credits: ESA/Rosetta/MPS for OSIRIS Team MPS/UPD/LAM/IAA/SSO/INTA/UPM/DASP/IDA. The 60 scientists who met at the Toulouse space centre’s SONC (Science, Operations and Navigation Centre) this weekend, plus a large number of other scientists taking part via internet, had the tricky task of finding five viable landing sites for Philae. 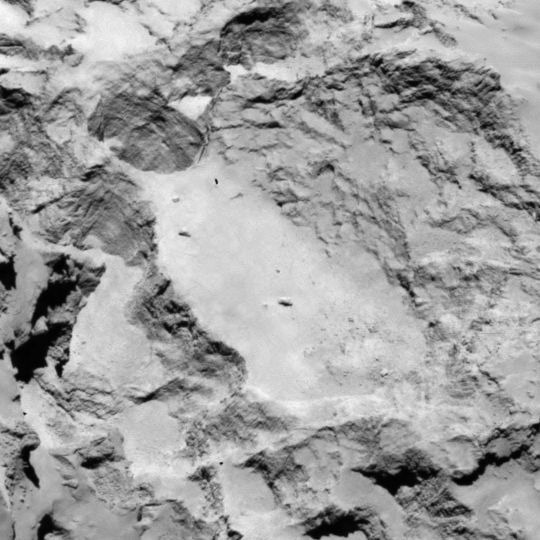 The areas selected had to meet a number of criteria–they must be able to ensure regular communication between Philae and Rosetta, provide a landing surface that will enable Philae to touch down under good conditions (avoiding rough terrain), and guarantee enough sunlight to recharge the lander’s batteries and enable the scientists to complete their operations. The five sites unveiled below have therefore been approved by these scientists, as theoretically offering the best guarantee of a successful landing and of a productive in-situ analysis of the comet.Between now and 14 September, this list will be refined and classed from the most suitable site to the least suitable, and a full landing strategy developed. 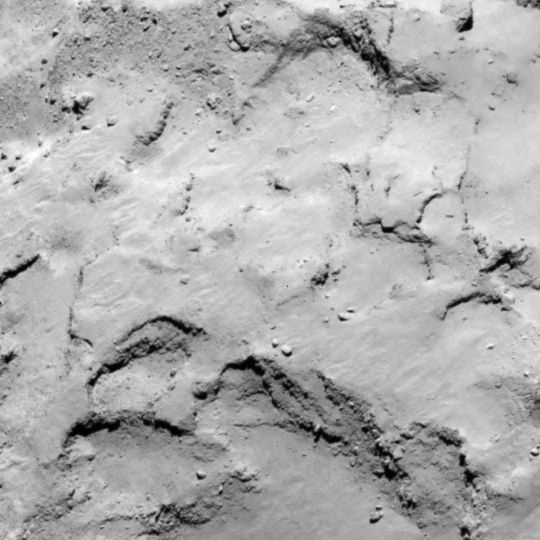 Rosetta will then make an approach to within 20 or 30 kilometres of the comet, in order to obtain more detailed images of the five sites and thereby identify the one with the smoothest terrain. The final site should be confirmed between 12 and 14 October. Site A is located on the larger lobe of 67P’s nucleus. Credits: ESA/Rosetta/MPS for OSIRIS Team MPS/UPD/LAM/IAA/SSO/INTA/UPM/DASP/IDA. The five sites have been chosen from a list of 10, listed from A to J but in no particular order. Site A is located on the larger of the two lobes, with a good view of the smaller lobe. Since the terrain between the two lobes may be subject to considerable outgassing, high-resolution images will be required for a better analysis of the site’s slopes and surface depressions, and to search for the best-lit areas. This image was taken on 16 August. It covers an area of approximately 1 km, centred around the middle of the landing ellipse. The display resolution is 1.85 m per pixel. Site B is located on the smaller lobe of 67P’s nucleus. Credits: ESA/Rosetta/MPS for OSIRIS Team MPS/UPD/LAM/IAA/SSO/INTA/UPM/DASP/IDA. Located within a crater-like structure on the smaller lobe, this site has a flat terrain that looks relatively safe for landing. However, sunlight conditions could prove problematic in the long term. High-resolution images will give a better view of any boulders present. This picture was taken on 16 August. It covers an area of approximately 1 km, centred around the middle of the landing ellipse. The display resolution is 1.85 m per pixel. Site C is located on the larger lobe of 67P’s nucleus. Credits: ESA/Rosetta/MPS for OSIRIS Team MPS/UPD/LAM/IAA/SSO/INTA/UPM/DASP/IDA. Site C is located on the larger lobe and offers a number of different surfaces, from well-lit to rough to very flat. 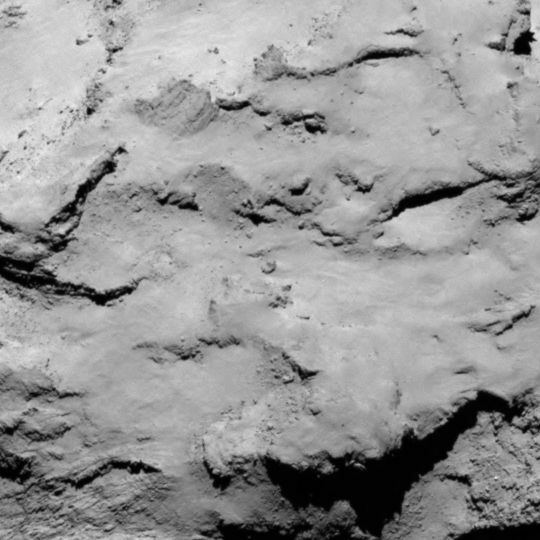 High-resolution images will enable a better assessment of any potential risks, but the site is generally well-lit—a plus point for the long-term scientific use of Philae. Site I is located on the smaller lobe of 67P’s nucleus. Credits: ESA/Rosetta/MPS for OSIRIS Team MPS/UPD/LAM/IAA/SSO/INTA/UPM/DASP/IDA. Site I covers a relatively flat area on the smaller lobe and features some terrain that may be recent. High-resolution imaging is needed to assess the surface conditions. The site’s sunlight conditions seem conducive to long-term scientific research.This picture was taken on 16 August. It covers an area of approximately 1 km, centred around the middle of the landing ellipse. The display resolution is 1.85 m per pixel. Site J is located on the smaller lobe of 67P’s nucleus. Credits: ESA/Rosetta/MPS for OSIRIS Team MPS/UPD/LAM/IAA/SSO/INTA/UPM/DASP/IDA. Fairly similar to site I and also located on the smaller lobe, this site seems to provide good surface features and sufficient sunlight, and therefore looks more promising than site I. 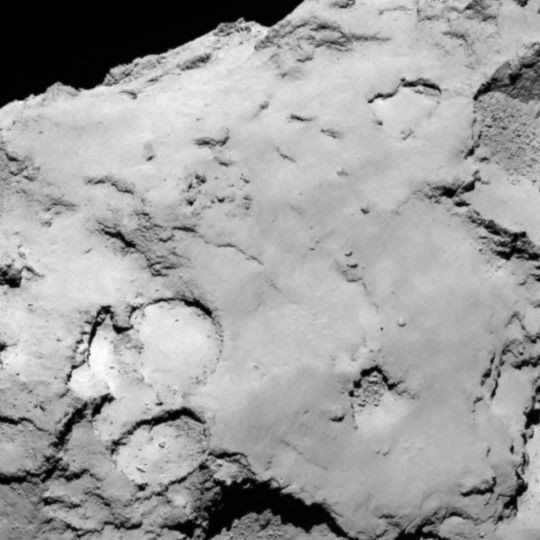 However, this remains to be verified by high-resolution images that will give a better view of any boulders present. This picture was taken on 16 August.It covers an area of approximately 1 km, centred around the middle of the landing ellipse. The display resolution is 1.85 m per pixel. 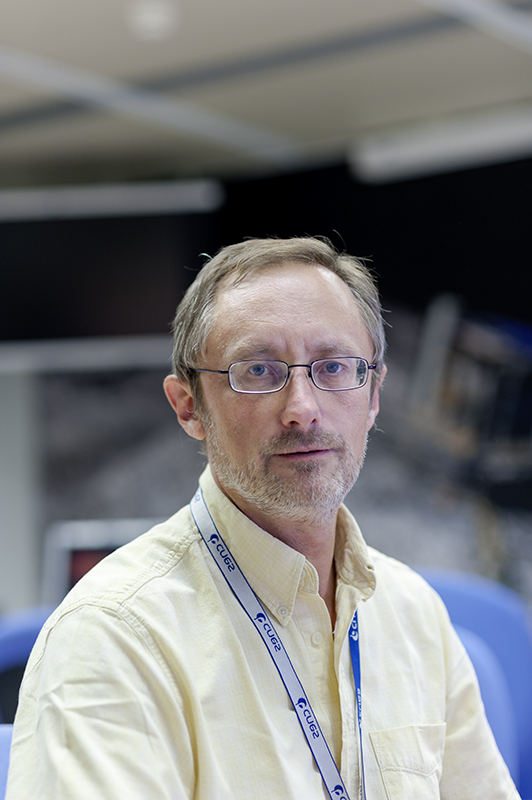 Philippe Gaudon, head of the Rosetta project at CNES, on SONC premises (CNES-Toulouse). Credits: CNES/G. Cannat.